I thought this might be of interest: parbuckling, used to load barrels (and other things) up a vertical slope, with a rope sling. 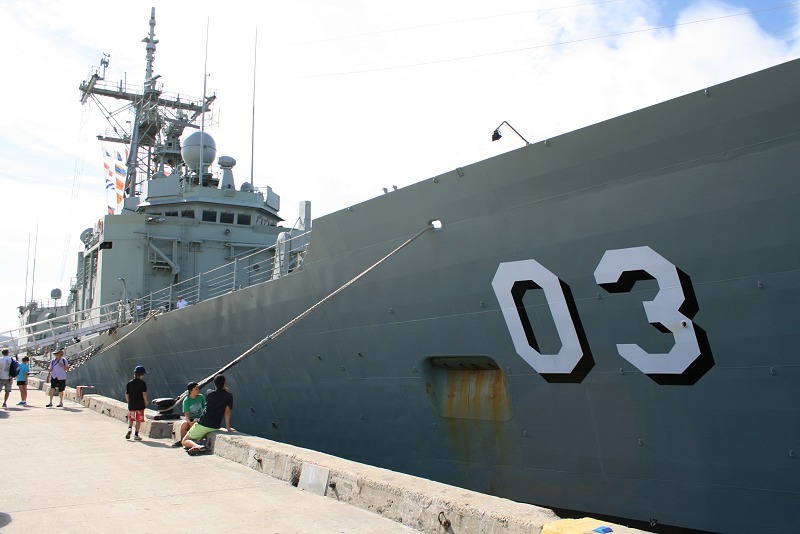 HMAS Parramatta, at the Wooden Boat Festival. I don't have a vertical photo to use but that isn't too wide? The website is being screwy on me, so I'll type up a bit from the leaflet we were given. "HMAS Parramatta is the fifth of eight ANZAC class frigates built for the Royal Australian Navy (RAN) by Tenix Defence Systems, Williamstown, Victoria. Same as last time, but with less words because I'm tired. There's a tent called the Shipwright's Village which had demonstrations of various skills (wrights should be the word to use there). This one is obviously showing how to make wood shavings more quickly. 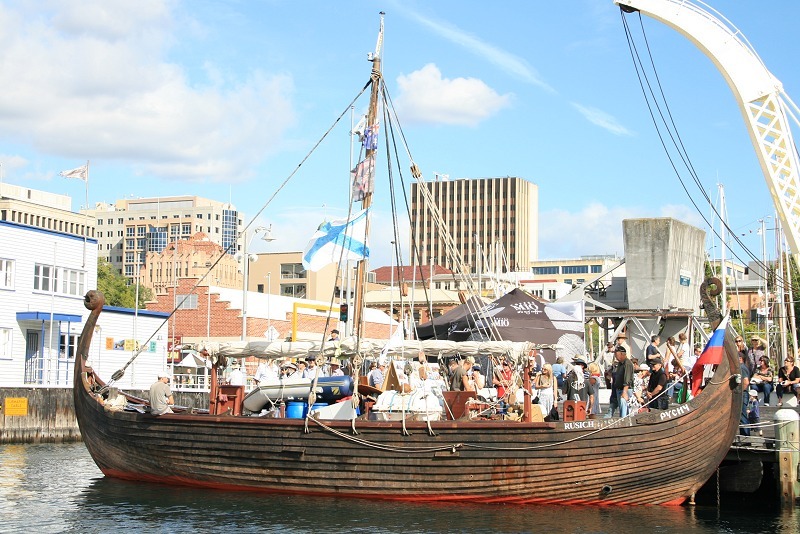 My plan for photos from the Wooden Boat Festival is to do two posts (of which this is the first) with a mixture of photos of things that I found interesting or that give a flavour of the event. To make it easier, the order of these photos is determined by the order they appear in the Gallery, unless there is a reason to put some in a particular order. Then I'll do one posts of the various ships. And then I'll do some focus on a particular boat/ship, until I get bored of them. 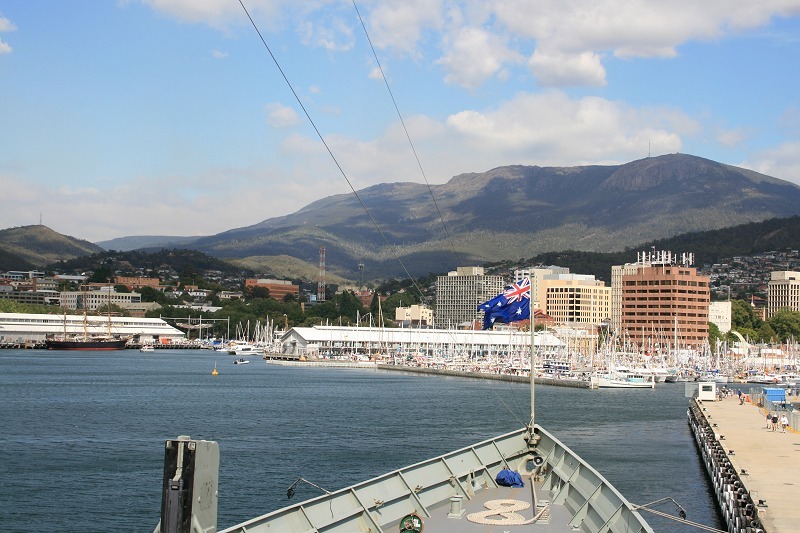 The second weekend in Hobart is the weekend of the Regatta, with a holiday on the Monday. 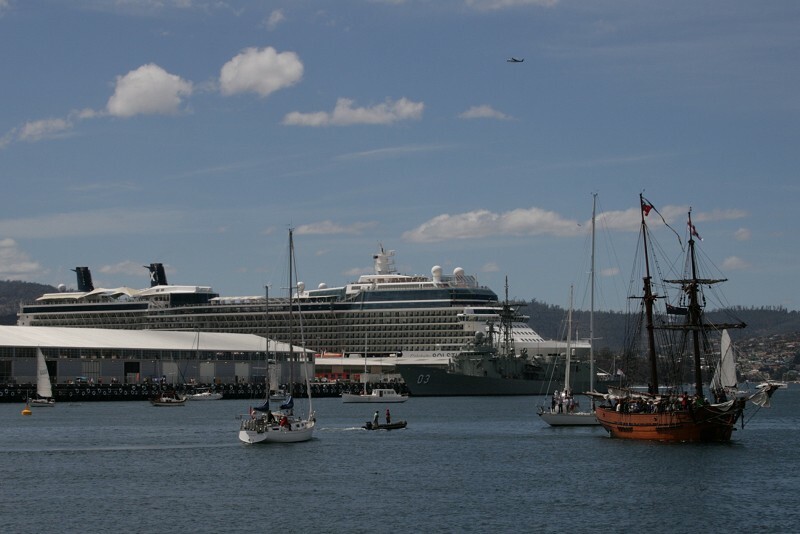 It's also the weekend of the Hobart Cup (horse racing), and every second year, the Australian Wooden Boat Festival. Any one of those events obviously attracts many extra people into the city. All three at once... I haven't seen the final figures for the WBF attendance, but over 100,000 seems likely. If that doesn't sound like much, the population of Hobart is only twice that. I've been to the Festival every year since, hmmm, I have a poster from 2001 advertising the Endeavour being there, so I went that year. I had thoughts this year of not bothering, there didn't seem to be anything new going on, but... this year there was no entry fee and they took down the fences. One big change as a result: in the past the event has been confined to one end of the waterfront (around Constitution Dock/Elizabeth St pier area), this year it was spread right across to Princes Wharf (adjoining Salamanca Place) and the edges sort of drifted out to the adjoining business premises. Anyway, enough talking. Onto the photos. The Hunter St area had two tents, with some smaller things around the edge. The endmost tent, shown here, had the Shipwrights Village (displays of maritime-related crafts) and a display of Indigenous Watercraft. The first tent had the Maritime Marketplace, which was crowded because of the rain and not as interesting as I remember it. I'm going to break my Wooden Boat Festival photos in three posts. There will probably be some duplication with photos I've already used. One problem here, is the tall ships present are all ones I've done long photo posts on before. While I have new photos of some, it doesn't seem worth doing a whole new post for each. While I ponder on it, when they get mentioned, I'll link to previous posts (as below). MV Cartela was not something I expected to see amongst the wooden boats. She's a wooden boat, certainly, but she's usually she's further along the waterfront, behind the cruise ferry terminals. On the weekend, she seemed to be operating as a floating bar, so I went on for a look and was surprised by what I found. I have photos from the Wooden Boat Festival last weekend to edit and write about, but it occurred to me I could just point you to here, here and here and save time. OK?